Has the battery in your Samsung Galaxy Tab 7 inch GT-P1000 or GT-P1010 past its best, maybe the battery overheats and drains quickly? If so we can repair your Galaxy Tab P1000 and P1010 battery by fitting a brand new one. Allow our expert technicians to fit an original battery part this being a Samsung SP4960C3A Galaxy Tab P1000 P1010 7 inch 4000mA WiFi/3G 3.7 Volt 14.8Whr Li-ion Battery. A dead, dying or faulty battery is classed by Samsung as a non-warranty repair, batteries are classed as consumable items, they will charge you accordingly for replacement. 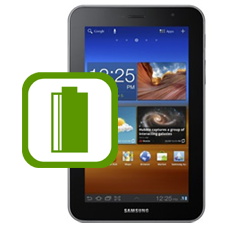 This Galaxy Tab battery replacement service is a cheaper option and performed to exacting standards. * Price includes the brand new original Galaxy Tab battery, fitting and fully insured return shipping in the UK. This is an in-house Samsung Galaxy Tab battery replacement service, when ordering this Galaxy Tab battery repair service you are required to ship the tab into our repair centre for works to be completed.